There is a sure-fire way to improve workplace morale and productivity while cutting costs at the same time. It’s simple: tell your people to stay home. What’s less simple is optimally managing remote teams. The topic is timely and relevant, because the prevalence of such teams is accelerating. According to a recent survey by Global Workplace Analytics, approximately 20% to 25% of the workforce teleworks at least part-time, and 80% to 90% of workers say they would like to do so. Another survey from the same firm finds the ranks of regular work-at-home (non-self-employed) employees have grown by 103% since 2005, with nearly four million employees now working from home at least half the time. 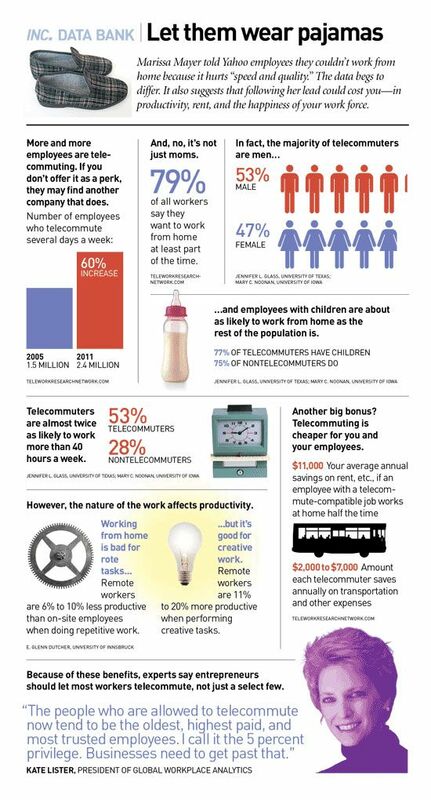 First, the good news: Studies show that telework teams work just as hard as, if not harder than, their worksite counterparts. According to Inc., remote employees are almost twice as likely1 to work beyond 40 hours a week and tend to be 20% more productive when they get to tackle creative projects remotely. The leader of a traditional face-to-face team often functions like the hub of a wheel, with team members as the individual spokes. Information, tasks, and relationships flow from the leader to each team member, and back to the leader again. Of course, each can “check in” easily and quickly. The challenge for remote leaders in today’s increasingly far-flung workplace is the need to adopt a different, more networked style. They need to create alternate hubs to encourage and make possible communication between team members — in essence to create and empower a network. That means giving up a certain amount of control and creating new practices and processes. Many leaders and managers find that to be extremely difficult. Others find it impossible. But it can be done with renewed focus, consistent and effective communication, and stretch opportunities for team members to empower and energize their engagement and productivity. Making sure the remote team is properly aligned and equipped to deal with the problems they face is a crucial first step. Simply transplanting a traditional team to a remote environment and expecting it to perform as it did previously may end in disappointment, frustration, and loss of money and time. Among the greatest technological changes of our time is the way we now communicate, particularly though social media. But what would become the most successful platforms has been difficult to predict. Who’d have thought an online college noticeboard would morph into a global communications phenomenon, or that 140 characters would be enough to engage people in millions daily in discussions about political issues or Lady Ga Ga’s latest outfit? What are predictable are the human needs that drive us. The desire to feel part of something bigger than oneself, to feel in control, to feel a sense of recognition — all of those apply in the workplace, whether you’re in a traditional office or a remote setting. Managing a remote team means managing those needs. Leaders need to find ways of creating a virtual water cooler where colleagues can share and bond, ways of recognizing team members’ achievements publicly, and ways of giving — and being seen to be giving — responsibility and autonomy. The alternative is a fragmented, neglected, and disempowered team, one that struggles to hit benchmarks and impact the bottom line regularly and positively. Social identity theory holds important lessons for any leader, but it’s perhaps especially useful for those who lead remote and virtual teams. Put simply, leaders must embody and represent the concerns, ambitions, and values of their teams. It’s not enough to simply “understand” or “relate to” or even “empathize with” with them. Leaders must demonstrate their connection by actively representing their teams within the wider organization and to senior leadership, thereby protecting and promoting team interests. The team may be virtual, but the leadership and connection must be authentic and transparent. Ensure that and you’ll be well on your way to leading a successful remote team.